Wild Child comes after Legaly Blonde, with 28 votes. Mean Girls got 70 votes, but maybe Mean Girls 2 got more votes if it was in this list. I don’t know! 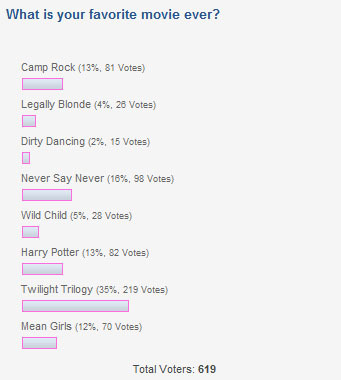 With only 1 vote difference, there are first with 81 votes Camp Rock, and with 82 votes Harry Potter. Justin Bieber’s movie Never Say Never got 98 votes, which makes it your second favorite movie ever! But first on the list is the Twilight Trilogy, with a stunning 219 votes! I totally agree with this, tonight I was at the premiere of Breaking Dawn (part1), and I just loved what they did with the movie! Have you girls already seen Breaking Dawn? I won’t spoil it for those of you who haven’t seen it yet, but I can ensure you, you should go as soon as possible, because I know you’ll all love it :) I just can’t wait for part 2, I’m so curious how that one will turn out! Please don’t forget to vote on our new poll, about your favorite taste of ice cream! It is not letting me vote for some strange reaosn right now! Will someone put in a vote for me on the tastes of ice cream??? Put STRAWBERRY!!!! If you do thank you!!! Just send one of these back saying you did this! I also wanted to tell you Selena Gomez fans, that her new music video “Hit the lits” came out! Just go to selenagomez.com and scroll down and there you will find it! Thanks to you for coming to my web-site girls! I am going to get twilight part 1 today or see it in theaters!!!! !how is it Mary? I really do have the first twilight and I am going to watch it for the 18th time!! !i am soooooooo team Edward!!! !he is just so hot and funny and well of course cute!!!! If you could tell me your team that would be great!!! !oh and in the 3rd movie I think it’s the 3rd but it could be another one…..any ways Edward and Bella get mairred!!!! !and Bella get pregnet I sooooo can’t wait well see you and tell me your teams!!!! Thank you for telling me your teams!! !